Vodice is a popular tourist resort just north of Sibenik in North Dalmatia, with good accommodation and a number of beaches. If you’re flying in to reach Vodice from outside of Croatia, either Split or Zadar airports would be the best choice for you. Vodice is actually roughly halfway between the two; however, Split Airport may be slightly better as there’s more flights to there from the UK and Europe. See our Getting to Split and Getting to North Dalmatia pages for details of flights to these two airports. If you’re travelling to Vodice from elsewhere in Croatia, the town has good connections to other places by bus. A good number of the coastal buses that run up and down the coast stop here. Or, if you’d like more options, you can always get a bus to nearby Sibenik and then another on to Vodice – Sibenik to Vodice is only about 20 minutes. The town is home to a number of churches including the 18th Century Parish Church of St Cross, and relics such as the 16th century Coric Tower. Okit Hill, above Vodice, offers great views and is also the site of Our Lady of Carmel Church; originally built in the 17th century, it was destroyed twice (most recently in the Homeland War). The current version was designed by architect Nikola Basic who also designed the wonderful Sea Organ and the Greeting to the Sun in Zadar. The Aquarium and Museum of Maritime Tradition has of course tanks of fish, as well as antique amphorae, old scuba diving equipment and models of ships. 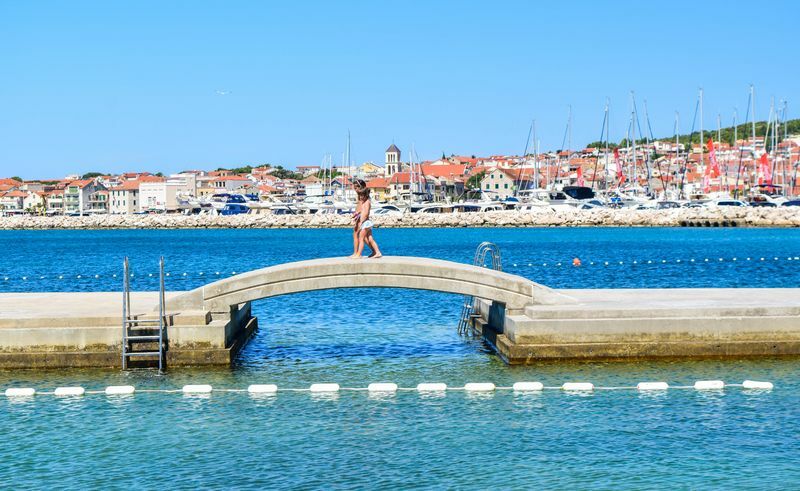 Vodice’s pretty harbour is a lovely place to spend some time, whether taking a look at the little shops or indulging in a cold drink or a sweet treat at one of the many cafes and restaurants. Sibenik is also easily reachable by bus or ferry, and would be a great choice for a day out to enjoy the many fine sights there. Beaches include Hangar Beach and Male Vrijule Beach, both close to the centre of town and both with good facilities. Both are pebbly, although Male Vrijule has an artificial lagoon structure (pictured below) which is both shallow (good for kids) and which also raises the water temperature slightly. Another popular beach is Srima, just outside of town. Another pebble beach, it is also quite shallow and suitable for children. Restaurant Sky is situated on the 10th floor of the Hotel Olympic Sky and offers wonderful views over the town and out to sea. A smart choice for an evening meal or a glass or two of wine at the bar. Konoba Tri Piruna is a reasonably-priced, friendly place that is one of the oldest restaurants in the town. Traditionally styled, its a great place to go for meat and fish dishes. Konoba Mediterano is another excellent choice to try out some fish and seafood dishes, and is in a great location by the harbour. The town is home to Hacienda, one of the better known clubs in Croatia, as well as Opium Club and Exit Club. The tiny but beautifully green islands of Prvic and Zlarin are just off this part of the Croatian coast. Prvic has just 400 inhabitants; as quite a quiet island, it would be best visited as a relaxing day trip to try some of the beach options there. Zlarin is a slightly larger island (but in fact has a smaller population of just over 200) and is well known for its beautiful coral. Both of these islands can easily be visited from Vodice. There is a daily boat that sails a few times a day from Vodice to Sepurine and Prvic Luka on Prvic, then to Zlarin and then on to Sibenik. (So would also be a good way of reaching Sibenik…albeit quite a bit slower than by bus!) This route is run by Jadrolinija. There are a number of road and mountain bike tracks in the region, making this a highly suitable destination for those looking for a bit of activity. The local tourist office site has a good guide to the different tracks. Vodice is also highly suitable for diving. Contact Vodice Dive for more details. Vodice has a good choice of hotels – these include the smart four star Villas Arausana & Antonina, the Hotel Olympia Sky and the Hotel Miramare, all of which are on the beach. There is also a great selection of apartment as well as holiday homes and villas – check out the selection on Booking.com. 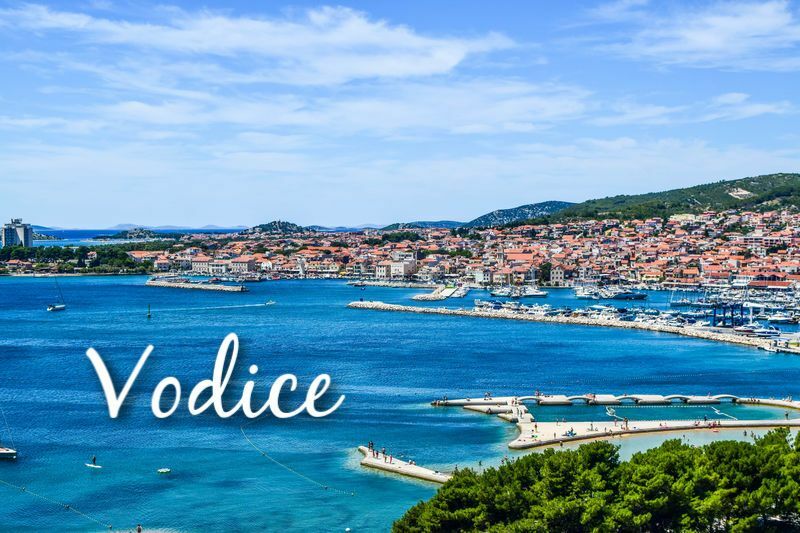 You can find out plenty about the town and what there is to see and do on the Vodice Tourist Office website.